Corneal tissue engineering has become more popular due to the shortage of donor cornea and graft rejection during allogenic transplantation. Bone Marrow Mesenchymal Stem cells (BMSC) play a significant role in regenerative medicine owing to its high differentiation potential and immunosuppressive property. Transdifferentiatin of MSCs to corneal cell types has been extensively studied. Presentation of transdifferentiated cells for therapeutic application is either by injection or in the form of cultured cells on a substrate. Here we propose cell sheet technology as a means to generate transdifferentiated corneal epithelial constructs from BMSCs. Rabbit BMSCs (RBMSC) were characterized by expression of stem cell markers, positive for CD90, CD44 and negative for CD34. The multipotent differentiation ability towards osteoblasts (calcium deposition, collagen) and adipocytes (Oil Red O) was confirmed. Thermoresponsive copolymer N-isopropyl acrylamide-Co-Glycidyl methacrylate (NGMA) was used to develop cell sheets. BMSCs were cultured on NGMA and induced for transdifferentiation using conditioned medium from rabbit limbal epithelial cell (RLEC) culture. Cells cultured in normal medium were considered as control. The differentiated cells were retrieved non-invasively by incubating at 23-25°C. Retrieved cell sheet showed molecular phenotype of corneal epithelial-like cells by the expression of Cytokeratin 3/12 and Connexin 43. The cornea of the eye comprehends of five layers, the outermost corneal epithelium, the Bowman's layer, and stroma; decement membrane and the inner endothelium. The outermost corneal epithelial layer is continuously replenished with cells from the limbal niche and epithelial damage can occur by various physical, chemical and genetical conditions. Depending upon the extent of epithelial cell damage it can be broadly classified in to partial or total limbal epithelial stem-cell efficiency (LSCD). Partial limbal stem-cell deficiency can be treated with autologous limbal graft from the contra-lateral eye, but has a limitation of donor site morbidity. Allogenic limbal transplantation is the widely used alternative for bilateral LSCD. However, allogenic transplantation demands use of immunosuppressive agents.1 Further, in total limbal or bilateral stem-cell deficiency, the availability of healthy donor tissue has become a major limitation.2–4 To enhance regeneration of the ocular surface, the amniotic membrane alone or in combination with cultured limbal stem cells has become more popular. Nevertheless, the denuded amniotic membrane is also allogenic in origin and occupies presence of antigenic of epitopes and risk of transmission of communicable diseases.5 Hence, it is necessary to find an autologous stem-cell source to address ocular surface regeneration. Mesenchymal stem cells (MSC) from various tissues like bone, dental pulp, adipose and corneal stroma has observed attraction due to its less immunogenicity and highest differentiation potential.6 These cells have got self-renewing capacities under stimuli and are capable of differentiating to other lineages such as bone, adipose, fat and muscle.7 Because of low expression of Major Complex II (MHC II) and CD 40, MSC could escape from the monitoring of immune system making them available for allogenic transplantation without being rejected from the host.8 If the MSC are autologous, all the potential hazards of allogenic grafts are eliminated. There are also reports on differentiation potential of MSC to corneal epithelial population in-vitro by co-culture with limbal epithelial stem cells or with supernatant from limbal epithelial cell culture.2 Holan et al compared the therapeutic potential of MSCs from bone marrow and adipose tissue with limbal epithelial stem cells.9 Smart polymers like thermo responsive polymer has been used in corneal tissue engineering for developing transplantable cell sheet.10 Smart polymer technology along with differentiated stem cells creates a novel platform for corneal tissue engineering. The cell sheet engineering using copolymer N-Isopropylacrylamide-Co-Glycidyl Methacrylate (NGMA) has been reported earlier for the suitability of these to develop a functionalized corneal epithelial sheet.11 The key factor modulating the thermo-responsiveness is the thickness of the polymer. The cells sheet can be harvested faster from the thin coated surface than from thickly coated polymer plate.12 In our study, spin coating was employed for uniform and thin coating of the polymer over the tissue culture plates. We have used Spin coated NGMA plates for retrieval of differentiated cells as a sheet. Since spin coating generates uniform spreading of the polymer which avoids the batch to batch variation and thickness, less than 20nm so that the cells can be easily recovered as flawless sheet with intact cell to cell junctions and matrix proteins. Stable, easily manipulated cell sheet can be attached to the cornea without any sutures. In this study attempt is made the generation of a differentiated cell sheet of RBMSC by culturing cell on polymer matrix and differentiating with the help of conditioned media from limbal epithelial culture. Alpha MEM, Foetal Bovine Serum (FBS), Trypsin EDTA, antibiotics (Pencillin-Streptomycin), Dulbecco’s Modified Eagle’s Medium/Ham’s F-12 nutrient mixture (DMEM/F12), and bovine insulin, Epidermal Growth Factor (EGF), Amphotericin B and adipogenic differentiation medium were procured from Gibco (Life Technologies USA). N-isopropylacrylamide (NIPPAm), Glycidyl Methacrylate (GMA), Dimethyl Sulfoxide (DMSO), Hydrocortisone, Sodium selenite, Transferrin, Bovine Serum Albumin (BSA), Trichrome Stains (Masson; HT15), Fluroscein Di Acetate (FDA) and Hoechst 33258 were purchased from Sigma, India. Primary mouse antibodies CD90 (Thy-1), Cytokeratin 3/12 (CK3/12, ab68260), CD44 (ab157107) ATP binding cassette subfamily G member 2 (ABCG2, ab3380), DNP63 (ab124762), Connexin 43 (ab11369), and secondary antibody anti-mouse Alexa flour 488 (ab150113) were procured from Abcam and CD34 (SC-65261) from Santacruz. The thermo-responsive polymer NGMA was synthesized as previously reported.11 The polymer solutiion (0.4% w/v in isopropyl alcohol) was spin coated on 35 mm tissue culture dishes using a Spin Coating Unit (Holmarc Opto-Mechatronics P Ltd, India). Each plate received 20 ml of NGMA solution and was spin coated at a speed of 1500 rpm for 10s. The coated plates were air dried at 60°C over night and rinsed with sterile cold (4°C) deionized water to remove unbound polymer. The plates were air dried again and sterilized using Ethylene Oxide gas. RBMSC were isolated from adult New Zealand white rabbit femur with prior approval from Institute Animal Ethics Committee and Institutional Committee for Stem Cell Research. The marrow was collected and aspirated aseptically in αMEM serum free medium and cells were dissociated by repeated gentle pipetting. The cell suspension was centrifuged and was washed thrice with PBS. The pellet at final wash was resuspended in αMEM supplemented with 10% FBS, 100 IU/ml Penicillina and 100 µg/ml Streptomycin. Cells were seeded in T25 culture flask and maintained inside a CO2 incubator (37°C/5% CO2/>90% relative humidity) with a media change on every third day. The isolated RBMSC was evaluated for stem cell potential by immunocytochemistry and flow cytometry for positive (CD90 and CD44) and negative (CD34) markers. The cellular differentiation potential was also evaluated by osteo and adipogenic potential using commercially available induction media. Immunocytochemistry: Cells at passage 2 or 3 were fixed in 4% PFA, followed by washing thrice with PBS and permeabilised with 0.1% Triton X-100. Cells were again rinsed with PBS and non-specific binding sites were blocked with 10% BSA for 10 min. Cells were then incubated overnight with primary antibodies against CD90, CD44 and CD34 at 4°C followed by incubating with Alexa 488 tagged secondary antibodies for 1 h at room temperature. Cell nucleus was counter stained with Hoechst 33258 (0.5 mg/ml in PBS) and viewed under inverted fluorescence microscope (Leica DMI6000, Germany). Flow cytometry: The RBMSC expressing stem cell markers was quantified by flow cytometry. Briefly, cells were trypsinised and fixed in 4% PFA for 2h. The non-specific binding site was blocked with 10% BSAand then resuspended in 1:100 dilutions of primary antibodies against CD 90 and CD34 for 1h. The cells were rinsed and again resuspended in 1:100 of secondary antibody for 1h. The stained cells were analyzed by flow cytometry (BD FACSARIA, USA) along with suitable negative controls. Differentiation potential of RBMSC: Multipotent differentiation potential of RBMSC was evaluated by induction into osteogenic and adipogenic lineage. In vitro osteogenic experiment was done by using osteogenic induction medium (Gibco). At time points 7, 14, and 21 days, cells induced for differentiation were analyzed for calcium deposition (Alizarin Red S and von Kossa staining) and collagen (Masson Trichrome staining). Alizarin red S was performed after fixing cells on 7th day using 4% PFA. The fixative was removed, and cells were rinsed with PBS. 1 ml of 2% (pH 4.1) Alizarin Red S was added and incubated at room temperature for 20 min. The stain was removed and cells were washed thrice with deionized water and observed under microscope (Motic AE31, Hong Kong) in bright field mode. The calcium deposition were confirmed by von Kossa staining.. Fixed cells were exposed to 5% silver nitrate solution under ultra violet light for 30 minutes. The black deposites of calcium was observed under microscope. The differentiation of MSC to osteoblastic lineage was analyzed by collagen deposition by using Masson’s Trichrome staining kit as per manufacturer’s instruction. The cells were viewed undermicroscope for collagen deposition. In vitro adipogenic differentiation was confirmed by Oil red O staining. The cells maintained in adipogenic differentiation mediafor 21 days were fixed in 10% formalin. Cells were rinsed with deionized (Millipore) water, 60% isopropanol and then air dried at room temperature. Lipid droplets were stained by incubating with Oil Red O for 30 min and observed under microscope. Limbal biopsy was performed with removal of the limbal ring along with adjacent 3 mm corneal and conjunctival tissues was excised and collected in PBS containing antibiotics. Limbal region was separated aseptically and cut into 2×2 mm explants. Multiple explants were placed inside cell culture dish at 5 mm distance from each other and incubated in MEM supplemented with 5% FBS and Pen-Strep antibiotics. After 3 days culture inside CO2 incubator, MEM media was switched with Supplemental Hormonal Epithelial Medium (SHEM) containing MEM, FBS (10%), DMSO (0.5 %), Transferrin (5µg/ml), Insulin (5 µg/ml), Hydrocortisone (0.5 µg/ml), Sodium Selenite (5 ng/ml), Amphotericin B (1.25 µg/ml), 50 (µg/ml), EGF (5ng/ml).13 The spent medium was collected on every alternate day after cells started migrating from the explants and till the plate attained confluency. The collected medium was filtered using 0.22µ syringe filter (Millex GP, Millipore) and stored at -20°C. The spent medium from different plates were pooled and used for cell culture. Cells at passage 2 were analyzed for stem cell potential by surface markers prior to differentiation experiment. The cells at passage 3 or 4 were used for differentiation experiments. The corneal epithelial spent medium was used to differentiate RBMSC to corneal epithelial cells. Approximately 1 × 105 cells of RBMSC was seeded in a 12 well plate (Nunc) and cultured in αMEM for 3 days or until subconfluency stage. Differentiation was initiated by switching to corneal epithelial differentiation media (1:1 ratio of the spent medium from RLEC culture and αMEM with 10% FBS) for 7 days with medium change at every 72 h. RBMSC and RLEC maintained in αMEM and MEM was taken as negative and positive control for differentiation. Cells were analyzed in 7 days by immunostaining, flow cytometry and quantitative Polymerase Chain Reaction (qPCR). Immunostaining: The induced and un-induced RBMSC were analyzed for the corneal epithelial specific marker CK3/12. The RLEC was considered as positive control. Cells were fixed in 4% PFA for minimum 1 h and immunostaining was done as described before. Flow cytometry: The percentage differentiation of RBMSC was analyzed by flow cytometry (Guava easyCyte 6HT, Millipore). The cells were cultured in induction medium for 7 days were evaluated by corneal specific markers CK3/12, ABCG2 and P63. RLEC cultured in SHEM medium was taken as the positive control. The un-induced RBMSC was taken as the negative control. Real time PCR: The differentiation was also characterized by identifying specific gene expression by quantitative Polymerase Chain Reaction (qPCR). Total ribonucleic acid (RNA) was extracted from induced and un-indued samples (using TRIzol reagent (Invitrogen) as per manufacturer’s instruction. Complementary Deoxyribo Nucleic Acid (cDNA) was synthesized using RT2 First Strand Kit (Qiagen) according to product sheet. The target gene was amplified using PCR kit (Power SYBR Green PCR Master Mix, Kapa) and analyzed using Real-Time PCR System (Light Cycler; Roche Applied Science). The details of primers and the annealing temperature used are given in Table 1. Development of cell sheet using NGMA: Rabbit bone marrow MSC at passage 3 or 4 were seeded on NGMA coated plates at a cell density of 3×105 cells/ml and cultured for 3 days. Differentiation was initiated as described before using RLEC spent media and cultured for 7 to 10 days. The cell sheet was harvested by incubating cells below the phase transition temperature (28°C) of NGMA. Initially cells were kept at 10°C for 1 min followed by incubation at 23-25°C for 10 min for complete retrieval. When the cells at edges of the plate started detaching, the cell sheet was peeled off from the plate as a sheet using a sterile Polyethylene terephthalate sheet (8 × 1 × 0.01 cm). Characterization of corneal cell sheet: To confirm the corneal differentiation and epithelial tissue formation the retrieved differentiated RBMSC cell sheet was analysed by immunostaining of CK3/12 and gap junctional protein Connexin 43 (Cx-43). The nucleus was counter stained with Hoechst 33258 and viewed under fluorescence microscope [Leica DMI6000 under green (I3) and blue (A) filters]. Enviorment Scanning Electron Microscopy (ESEM): The morphology of cell sheet was evaluated by observing at high magnification under ESEM. Retrieved cell sheet was fixed in 2.5% glutaraldehyde for 30 min and viewed under ESEM (FEI quanta 200). Fibroblast like colonies were started to appear after 4 days of RBMSC culture. (Figure 1A) and the cell morphology were maintained over 7 days (Figure 1B). The cell proliferated fast and could split by normal Trypsinization (Figure 1). Figure 1 RBMSC culture (A) Cells at day 4 shows fibroblast like cells start growing as colonies (B) Day 7 shows monolayer of cells. Expression of Stem cell markers: The analysis of CD90, CD44 and CD34 markers in RBMSC confirmed the stem cell characteristics (Figure 2). 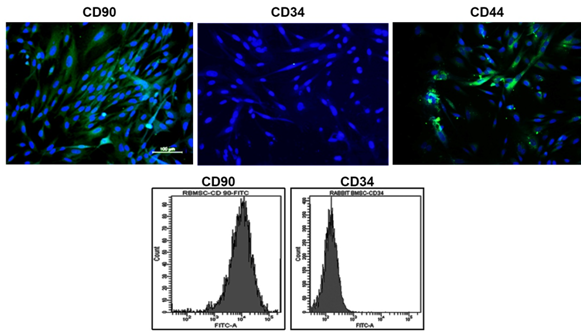 The positive representation of CD90, CD44 and negative expression of CD34 implies that isolated cells were stromal stem cells of mesenchymal origin. Quantitation by flow cytometry further gave insights that 90±0.3% cells were positive for CD90 (mesenchymal) and only 1.5% cells were positive for CD34 (hematopoietic) (Figure 2). Figure 2 Characterization of RBMSCs by the expression of stem cell markers. Row 1 shows images of positive markers, Row 2 shows flow cytometry analysis CD90 and negative marker CD34. Differentiation potential of RBMSCs towards osteo and adipogenic lineages: The Alizarin red S staining of RBMSC cultured in osteogenic differentiation medium showed intense red color over the monolayer (Figure 3). 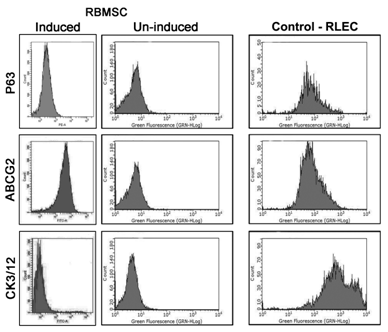 This indicates the differentiation potency of RBMSC to osteogenic lineage. At the end of 21 days induction, the calcium phosphate deposition visualized on differentiated MSC by von Kossa’s staining reconfirms the osteogenic differentiation. The trichrome staining confirmed the collagen (blue) deposition by differentiated cells. Adipogenic differentiation evaluation showed distinct oil droplets at day 21 by Oil Red O staining as depicted in (Figure 3). The Negative control (cells culture in the accustomed medium) did not show any differentiation to osteo and adipo-lineage till day 21.This data again confirms that isolated stem cells are capable of differentiation to different lineage according to all minimum criteria defined by the International Society for Cellular Therapy (ISCT). Figure 3 Differentiation potential of RBMSC towards osteo and adipo lineage – First row shows images of differentiated RBMSCs and Second row shows images of undifferentiated BMSCs. Figures (a) and (e) Alizarin Red S; (b) and (f) Vonkossa; (c) and (g) Masson Trichrome; (d) and (h) Oil Red O indicates the differentiated vs control respectively. Rabbit limbal epithelial cells in culture started migrating out from explants after three days in MEM. When the media was switched to SHEM, the cells showed cobble stone morphology of epithelial cells (Figure 4). Figure 4 Rabbit Limbal Epithelial Culture shows cobble stone shaped epithelial cells migrating from explants (a) low magnification 10X and (b) Higher magnification 20X. Figure (c) shows LESC migrating out from limbal explants. The RBMSC induced using spent media collected from RLEC culture for seven days showed evident changes in morphology. Cells with spindle morphology initially were seen to be broadened compared to un-induced groups (Figure 5). Figure 5 Differentiation of RBMSC to corneal epithelial cells using spent media from RLEC Figure (a) shows fibroblast morphology of RBMSC in un induced group and (b) shows cells at day 7 after induction. The cells show broadening in morphology and reduction in proliferation. Immunostaining: The differentiation of RBMSC to corneal epithelial lineage was confirmed by the expression of the corneal epithelial specific marker CK3/12. 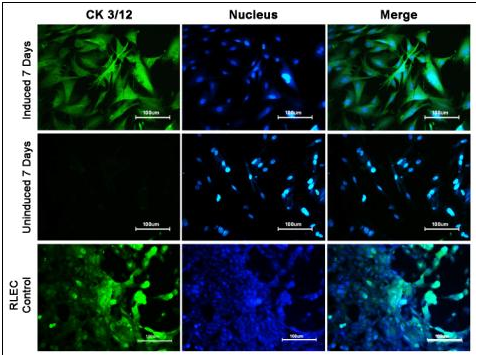 The RBMSCs induced for differentiation showed high positivity for the CK3/12 marker expression compared to negative expression in un-induced cells (Figure 6). The expression of marker by the differentiated cells was similar to the positive control (RLEC). Row 1 shows Induced cells at day 7 Row 2 shows Un-induced cells at day7 Row 3 shows RLEC. Flow cytometry: The differentiation method followed in this study showed that RBMSC induced with corneal differentiation media showed increased expression of epithelial specific markers compared to the uninduced group (Figure 7). The percentage expression of CK3/12 terminal epithelial marker increased to 34.5% compared to 8.4% seen in un–induced group. The ABCG2, which is expressed by bone marrow stem cells and basal limbal epithelial cells, showed 95.1% positivity in transdifferentiated RBMSC compared to un-induced group which showed only 19.9%. The expression of P63, which is a putative stem cell marker, was 46.1% in induced cells compared to un-induced group. The control RLEC showed positive expression of CK3/12, P63 and ABCG2 as expected and confirmed that the chances of co-existance of different population of cells (Figure 7). Figure 7 Flow cyotmetry analysis of induced and un-induced RBMSC: Row 1 shows RBMSC- induced P63, un-induced P63 and RLEC, Row 2 shows: RBMSC induced ABCG2, Un-induced ABCG2 and RLEC, Row 3 shows: RBMSC Induced CK3/12 at day 7, Un-induced RBMSc at day 7, and RLEC. Real time PCR: Quantitative real time PCR was performed to compare the fold expression of epithelial cell markers of ‘induced’, and ‘un induced’ groups. 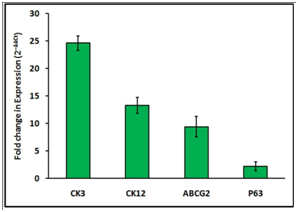 Differentiation induced RBMSC showed upregulation of CK3, CK12, P63 and ABCG2 genes compared to the un induced RBMSC (Figure 8). CK3 expression showed 25 fold expressions which means that the cells were able to differentiate corneal epithelial like cells in 7 day of induction and CK12 also showed 13 fold expression. The ABCG2 showed 9 fold upregualtion whereas double fold increase in P63 expression compared to un-induced group. The gene expression data supports expression of markers at protein level upon induction (Figure 8). Figure 8 Relative gene expression of corneal and stem cells specific genes by differencted RBMSCs. The qPCR analysis of induced and un-induced RBMSC for 7 Days showed that corenal specific and MSC specific genes are expressed in the trans differentiated culture. The values obtained were normalized with expression of control (GAPDH gene) (N=3). Development of cell sheet using NGMAL: RBMSC cultured on spin coated NGMA plates were transdifferentiated into corneal epithelial lineage as described before. Intact cell sheet was retrieved from NGMA plates by lowering the incubation temperature below 28°C (Figure 9A). The morphology of cells observed under ESEM in the retrieved transdifferentiated corneal construct showed intact epithelialization (Figure 9B). Figure 9 (a) Cell after retrieval from NGMA plate (b) ESEM of trans differentiated cell sheet. Intact cell-cell junction can be observed. Characterization of corneal cell sheet: The analysis of epithelialization of the transdifferentiated corneal construct retrieved from NGMA by tissue specific markers like CK3/12 and CX43 confirmed the formation of corneal epithelial cells (Figure 10). The positive expression of Connexin-43 in the construct implies that cells were able to epithelialize (Figure 10). Figure 10 Immuno-cytochemistry analysis of cell sheet after retrieval showing expression CK3/12 and CX-43. Row 1 shows the expression of CK3/12 and Row 2 shows positive expression of CX43. The donor tissue limitation in ocular surface regeneration has been addressed with transplantation of the corneal limbal stem cell derived cell sheets. The cell source for generating epithelial cell sheet is corneal tissues that are not useful for direct transplantation. An alternate stem-cell source for developing corneal epithelial cells is an unmet clinical requirement. It has been shown that Bone Marrow derived MSC as very promising cell source in corneal tissue engineering due to its potential regenerative capability owing to immune modulatory effect and differentiation potential.14 Results presented in Figure 2&3 shows the characterization and differentiation potential of RBMSC. Flow cytometry and immunostaining of CD90 and CD34 revealed that the isolated cells were non-hemopoietic in origin which was further evident by osteo and adipogenic differentiation data.15 Administration of MSC by peritoneal or systemic routes has been reported for corneal wound healing taking the advantage of the homing efficiency of these cells to the injury site.16 Trans differentiation of MSC to corneal epithelial cells has been trusted as a promising therapeutic approach for bilateral limbal stem-cell deficiency in the form of autologous adult stem cells source.17 The ability of BMSC to corneal differentiation by transplantation using the amniotic membrane has already been reported.18 Amniotic membranes are the most popular carriers in corneal tissue engineering due to the presence of growth factors such as Transforming Growth Factor and Activin A, which promotes the re-epithelialisation of the damaged cornea.19 Due to the issues with immunogenicity, alternate methods have been proposed that helps to overcome the use of the amniotic membrane. Holan et al showed that MSCs cultured from bone marrow and adipose tissue and grown on poly(L-lactic) acid nanofiber scaffolds when transferred injured rabbit eye showed similar therapeutic effects to transplantation of limbal epithelial stem cells.9 In this study we established a corneal epithelial construct by cell sheet technology of trans differentiated RBMSC using spent media from corneal limbal explant culture It is believed that the cells in the limbus are capable of giving paracrine signals to stem cells or progenitor cells to differentiate to corneal epithelial lineage.20 Zhao et al.,14 showed that limbal niche cells can induce transdifferentiation of oral mucosal epithelial cells into corneal epithelial-like cells.21 In another study, Soleimanifar et al reported the differentiation of conjunctival MSC into corneal epithelial cells.22 Hence it is an established concept that limbus derived cells are capable of transdifferentiating MSCs. 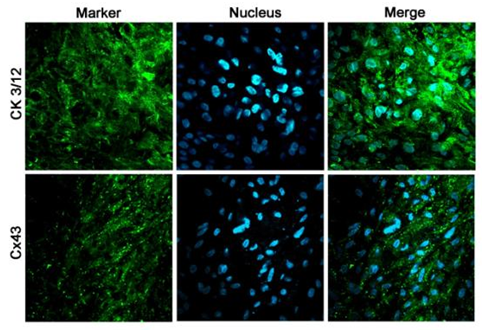 In this study, four potential markers related to trans differentiation of BMSCs like CK3, CK12, ABCG2 and P63 were evaluated. The positive expression of CK3/12 in trandifferentiated cells at an early stage of 7 days as shown in the Figure 6 is promising. This data further supported by flow cytometry reconfirms the reports. Transfer of differentiated cells to injured cornea is critical. Culture and harvest of cell sheets for corneal tissue engineering that have been progressed to clinical trials.23 Similarly there are studies on retrieval of MSC cells sheets from thermoresponsive gels without trypsinization.24 Here we try the retrieval of transdifferentiated corneal epithelial like cells from thermoresponsive NGMA culture surface. The first section of the study explains the procedure for differentiation of rabbit bone marrow derived MSC to corneal lineage and the second section describes methods to develop corneal constructs from transdifferntiated MSCs from thermoresponsive NGMA surface. Mesenchymal differentiation to corneal epithelial like cells was obtained by based on previous report by Gu et al.,2 but with slight modifications. In their study, MSCs were cultured in trans well system with rabbit limbal stem cells and supernatant medium from limbal stem cells. The both culture systems showed that the chemical factors released by limbal stem cells had an important role in differentiation of MSC to corneal epithelium. However, subculturing differentiated cells using enzymes may affect the already acquired epithelial characters when the cells are used follow up applications, especially in clinical translation. Hence this study aimed to differentiate MSC on thermoresponsive culture surface and then harvest as cell sheet construct by a non-invasive non-enzymatic method. The culture medium for differentiation of RBMSCs was refined with a mixture of SHEM and corneal limbal epithelial spent medium. The co-expression of CK12 along with CK3 represents the differentiation potential of RBMSC to corneal epithelial like cells. Even though the differentiation potential of RBMSC with RLEC spent media, have already been reported they were able to maintain expression of CK3 only up to 3 days.2 The results presented in Figure 6 showing differentiation using modified cell culture system is capable of maintaining expression of terminal differentiation marker CK3 of epithelial cells up to 7 days in culture. Once the differentiation of RBMSC to corneal epithelial lineage was optimized, the same culture system was practiced on thermoresponsive NGMA dish. Multilayered cells formed from explants on NGMA were retrieved as sheet like constructs by simple variation of temperature. The tissue specific characteristics were also analyzed on retrieved cells sheets. qPCR data also supports finding in flow cytometry by the fold expression of the corneal epithelial cell differentiated the marker CK3 during differentiation. The retrieved cell sheet expressed all the properties of corneal epithelial cells substituting the use of same in corneal tissue engineering in total limbal stem cell deficiency. Connexin gap junction proteins are specialized cell surface membrane structures that directly connect the cytoplasms of adjacent cells.26 It is considered as the marker for corneal and limbal suprabasal epithelial cells.27,28 The expression of connexin 43 in transdifferentiated cell sheet further substantiates the finding of the differentiation of mesenchymal stem cell to corneal epithelial lineage. Positive expression of CK3/12 suggests suitability of cell sheet in corneal stem-cell deficiency therapy. Since the transdifferentiation was attempted with spent media from limbal epithelial cells culture, there is a chance of various kind of signaling molecules from explants to enter in to BMSC during the path ways of differentiation.29 Four major genes (CK3, CK12, ABCG2 and P63) that we have selected for verifying the transdifferentiation potential of MSC was expressed in different cells of limbal explants culture. Hence, the modified protocol for transdifferentiation followed here supports the expression of different genes related to corneal epithelial cells culture. The attempt to culture cells on the thermoresponsive surface selectively avoids the use of harmful effect of trypsin during passaging of cells. The cell sheet with ECM can easily be retrieved within a short duration time that is 7 days and is ready for transplantation. This method avoids the time for treating patients with total LSCD and hold immense posibility to derive patient specific corneal construct by alternate stem cell source. In vitro analysis of differentiation of rabbit bone marrow MSC revealed that the cells differentiated to corneal epithelial lineage within 7 days of experiment. The trans-differentiated cells were able to express markers of corneal epithelium. The proposed methodology avoids use of feeder layer and allogenic amniotic membrane in therapeutic scenario and allows development of transplantable corneal constructs. Further exploration of the results presented here with in vivo efficacy evaluation will advance this technology closer to clinical application. Authors acknowledge the financial support to TVK and AKPR (Grant #: SR/SO/HS-0042/2012) from Department of Science and Technology, Government of India. The authors have no conflict of interest or competing financial interests. Chen JJ, SC Tseng. Abnormal corneal epithelial wound healing in partial–thickness removal of limbal epithelium. Investigative Ophthalmology & Visual Science. 1991;32(8):2219–2233. Gu S, Xing C, Han J, et al. Differentiation of rabbit bone marrow mesenchymal stem cells into corneal epithelial cells in vivo and ex vivo. Molecular Vision. 2009;15:99–107. Saini J, Madhukar, AK Jain, et al. Perspectives in eye banking. Indian Journal of Ophthalmology. 1996;44(1):47–55. Du Y, Funderburgh ML, Mann MM, et al. Multipotent Stem Cells in Human Corneal Stroma. Stem Cells. 2005;23(9):1266–1275. Malhotra C, A Jain. Human amniotic membrane transplantation: Different modalities of its use in ophthalmology. World Journal of Transplantation. 2014;4(2)111–121. Reinshagen H, Auw Haedrich, Sorg RV. Corneal surface reconstruction using adult mesenchymal stem cells in experimental limbal stem cell deficiency in rabbits. Acta Ophthalmologica. 2011;89(8):741–748. Prockop DJ. Marrow Stromal Cells as Stem Cells for Nonhematopoietic Tissues. Science. 1997;276(5309):71–74. Ryan JM, Barry FP, Murphy JM, et al. Mesenchymal stem cells avoid allogeneic rejection. J Inflamm (Lond). 2005;2(1):8. Holan V, Trosan P, Cejka C. A Comparative Study of the Therapeutic Potential of Mesenchymal Stem Cells and Limbal Epithelial Stem Cells for Ocular Surface Reconstruction. Stem Cells Transl Med. 2015;4(9):1052–1063. Hopkinson A, Vm Varghese, Tv Kumary. A novel cytocompatible thermoresponsive co–polymer for corneal tissue engineering. Acta Ophthalmologica. 2008;86(243). Joseph N, TIlak, Vidya, et al. A Cytocompatible Poly(N–isopropylacrylamide–co–glycidylmethacrylate) Coated Surface as New Substrate for Corneal Tissue Engineering. Journal of Bioactive and Compatible Polymers. 2010;25(1):58–74. Akiyama Y. Ultrathin poly (N–isopropylacrylamide) grafted layer on polystyrene surfaces for cell adhesion/detachment control. Langmuir. 2004;20(13):5506–5511. Loureiro RR, Cristovam PC, Martins. Comparison of culture media for ex vivo cultivation of limbal epithelial progenitor cells. Mol Vis. 2013;19:69–77. Li F, SZ Zhao. Mesenchymal stem cells: Potential role in corneal wound repair and transplantation. World J Stem Cells. 2014;6(3):296–2304. Lin S, Xin ZC, Dai J, et al. Commonly used mesenchymal stem cell markers and tracking labels: Limitations and challenges. Histology and histopathology. 2013;28(9):1109–1116. Kean TJ, Paul Lin, Arnold. MSCs: Delivery Routes and Engraftment, Cell–Targeting Strategies, and Immune Modulation. Stem cells international. 2013. p. 13. Jiang TS, Cai L, Ji W, et al. Reconstruction of the corneal epithelium with induced marrow mesenchymal stem cells in rats. Mol Vis. 2010;16:1304–1316. Rohaina CM, Then KY, Ng AM. Reconstruction of limbal stem cell deficient corneal surface with induced human bone marrow mesenchymal stem cells on amniotic membrane. Translational Research. 2014;163(3):200–210. Koyano S, Fukui A, Uchida. Synthesis and release of activin and noggin by cultured human amniotic epithelial cells. Dev Growth Differ. 2002;44(2):103–112. Cheng CC, Wang DY, Kao MH. The growth–promoting effect of KGF on limbal epithelial cells is mediated by upregulation of DeltaNp63alpha through the p38 pathway. J Cell Sci. 2009;122(24):4473–4480. Zhao XY, Xie HT, Duan CY, et al. Rat limbal niche cells can induce transdifferentiation of oral mucosal epithelial cells into corneal epithelial–like cells in vitro. Stem Cell Res Ther. 2018;9(1). Soleimanifar F. Conjunctiva derived mesenchymal stem cell (CJMSCs) as a potential platform for differentiation into corneal epithelial cells on bioengineered electrospun scaffolds. J Biomed Mater Res A. 2017;105(10):2703–2711. Nishida K, Yamato M, Hayashid. Corneal reconstruction with tissue–engineered cell sheets composed of autologous oral mucosal epithelium. N Engl J Med. 2004;351(12):1187–1196. Kotobuki N, K Murata, K Haraguchi. Proliferation and harvest of human mesenchymal stem cells using new thermoresponsive nanocomposite gels. J Biomed Mater Res A. 2013;101(2):537–546. Morita M, Fujita N, Takahashi. Evaluation of ABCG2 and p63 expression in canine cornea and cultivated corneal epithelial cells. Vet Ophthalmol. 2015;18(1):59–68. Simon AM, DA Goodenough. Diverse functions of vertebrate gap junctions. Trends Cell Bio. 1998;8(12):477–483. Chen Z, De Paiva CS, Luo L, et al. Characterization of putative stem cell phenotype in human limbal epithelia. Stem Cells. 2004;22(3):355–366. Chen Z, Evans WH, Pflugfelder S. Gap junction protein connexin 43 serves as a negative marker for a stem cell–containing population of human limbal epithelial cells. Stem Cells. 2006;24(5):1265–1273. Ebrahimi M, E Taghi Abadi, H Baharvand, et al. Limbal stem cells in review. J Ophthalmic Vis Res. 2009;4(1):40–58. ©2018 Raj et al. This is an open access article distributed under the terms of the Creative Commons Attribution License , which permits unrestricted use, distribution, and build upon your work non-commercially.